Guests must be SDHS members or pay $15 at the door for entry. Join us for a private tour of the growing grounds. Everything should be at its spring best. On this tour of the nursery and packing facilities, we'll learn about propagating, planting, and maintaining many of the plants of the Proteaceae family. Resendiz Brothers Protea Growers LLC was established in 1999 with a passion for growing exotic flowers and a commitment to providing customers with the highest quality products and service. With decades of farming experience in California's ideal Mediterranean climate, Resendiz Brothers delight in growing spectacular flowers for customers who demand unique and creative floral options. 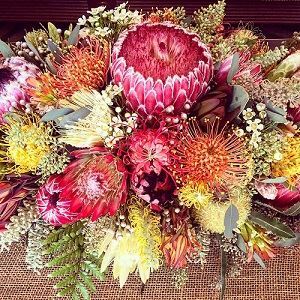 What began as a business focused on proteas has grown into a boutique-type flower farm offering a vast selection of the most distinctive American Grown flowers. In addition to proteas, the growers now cultivate more than 350 varieties of flowers and foliages, and the selection continues to grow! *Note that online pre-registration is required. By attending you agree to waive all claims against SDHS and any entities associated with the visiting the garden or related to participation and travel to and from the garden. No pets or strollers are allowed in the garden. The garden is not handicapped accessible. Wear comfortable walking shoes. The garden may contain uneven steps and pavement. Stay on paths and respect your own abilities to navigate stairs, steps, paths and walkways.